It's become fashionable in wine geek circles to bash the tasting note. It seems the venerable note has gotten mixed up in the fight over scoring wines on the 100 point scale, so that "flavor descriptors" and other hallmarks of most tasting notes are about as stylish as wine ratings. You'll get no love from me over rating wines with points. What's a "94" versus a "95?" Points suggest a false constancy about wine. They are objective about a medium judged by subjective instruments, our noses and mouths. Really, they are just guesses, and I'd rather read a more prosaic, possibly even poetic, estimation of a wine. I love a good tasting note. And I love this book, my first book on the subject of wine, the one, something I'll carry with me always. Yes, always. It's not a chapter book. It doesn't recount the history of wine and wine culture. There are no sordid tales of wine industry intrigue and despair, no polemics about biodynamics or terroir or anything we usually see in print these days. Nope, it's just a book full of tasting notes, from the master himself, legendary Christie's wine auctioneer Michael Broadbent. And if you like tasting notes, this is a book for you, even though it's 20 years old. You won't find tasting notes on recent vintages (though there is a more recent update of this book). You won't find a section on "orange" wines or a vertical tasting of some obscure Jura producer that's hip today. I don't think there is even a tasting not from any wine from the Jura region of France. However, you will find notes on wines going back two centuries, notes that tell a history of wine through the spare prose of Broadbent's notebooks. Broadbent's position as head auctioneer allowed him to vet cellars full of all kinds of treasures and taste incredibly rare wines prior to auction to ensure provenance and quality. He was also regularly invited to high profile tastings of famous bottles. That a few of those tastings were later found to based on forgeries - and how do you authenticate wines you've maybe never tasted before, or once or twice over decades? - should not affect our view of the man or his great work. Yes, tasting and writing notes about wine is great work. I may never have become a winemaker were it not for this book. I certainly wouldn't appreciate the tasting note so much, nor have learned so much reading about wines I'll certainly never have the chance to try. Broadbent's prose is generally plain. I swear that somewhere in this book there's an eyebrow raising allusion to a wine smelling like, and I try to quote from memory, a clean, well-scrubbed youth after exercise. Mostly though, it's full of nondescript phrases and flourishes like "A delicate, charming wine, soft, scented, with good length." Yet these words are tremendously meaningful to me. Who doesn't want to be charming? Who doesn't love wine that's delicate? It's all the more interesting that this note is on the 1847 Ch. Rauzan. Yes, 18. This book is full of both the simple and then profound, much like great wine. Yes, the notorious forger Hardy Rodenstock's tastings account for a portion of some of the more famous wines. Broadbent has been pilloried for his alleged complicity in accepting fakes as genuine, and while I'm sure there are decisions he regrets, how can we hold Broadbent to task too much when he was often tasting wines for the first time? Or better yet, what if we let his notes speak for themselves? About the 1928 Ch. Petrus tasted at a Rodenstock event in the mid-'80s, "Extraordinarily rich, high-toned bouquet, sweet, hammy, reminiscent of a late-harvest Zindandel." Perhaps that's exactly what it was, assuming this was one of the fakes. It's true that I don't refer much to this book these days, though I have had fun diving into it again in preparation for this post. And the torn dust jacket, the broken spine, those don't change my feelings for this book. It's incredibly special to me, more so than it probably should be and certainly more so than might make sense to anyone else. Some things just don't make sense, but there they are. And here's this book, still. With the San Francisco 49ers in the Super Bowl today, I had to have Dungeness crab and good white wine while enjoying the game. For a long time I found myself drinking white Burgundy with crab. Then a friend commented innocently, white Burg? Oaky chardonnay? He had a point. Minerally and older oak aged white Burgundy can be a lovely match for the sweet flavors of cracked crab. But anything with newer oak showing in the flavor profile can overwhelm the delicate nature of good crab. So today I thought - why not something from the south of France, where white wine and seafood may both have been invented. But should I have something rich and fancy? No. How about a simply Vin des Pays des Bouches du Rhone from Ch. de Roquefort? Perfect. 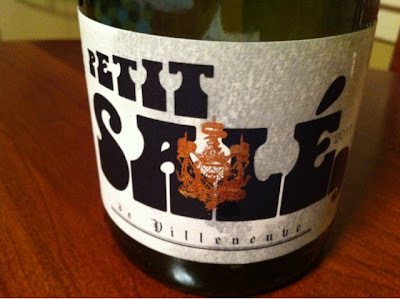 This bottle was the 2011 Petit Sale de Villeneuve, which sells for around $10 and comes from organically grown Clairette grapes (one of the common white grapes of the southern Rhone). There's nothing terribly remarkable about this wine. Except that it is simply perfect, to my taste anyway, for crab or other shellfish. The wine is pale in color and fresh smelling with an unmistakable lemony aroma and flavor. The finish is not long or profound. It's just delicious. There's even a little note on the back label of the wine from the owner of Juveniles in Paris to say this isn't "serious" wine. It isn't for oohing and ahhing over. Just drinking. Perhaps in large amounts. I couldn't agree more. And even though my 49ers didn't pull off a miracle comeback in a tortuously long game, the wine delivered. Look for it if you love good wine and want a great pairing for seafood. I found this at Storyteller in Portland and it's a Thomas Calder Selection, imported by Triage in Seattle.